As the sun shone bright on Orlando, Fla., and radio insiders from around the world poured into the conference hotel for the industry’s largest U.S. convention of the year, one man was out by the pool … with his radio. “I’m interested in the local formats, what they’re playing … and it’s entertainment,” said Carl Marcuzzi, senior editor with Radio & Television Business Report, explaining to the Free Radio Alliance why he takes a radio with him wherever he goes. “These stations are the voice of the community,” he said. The word “community” surfaced over and over at the Radio Show to describe the way radio entertains, creates jobs, serves as a lifeline in times of disaster and provides promotion for emerging artists. At this year’s Marconi Radio Awards Dinner & Show, an event hosted by the National Association of Broadcasters (NAB) to recognize stations and individuals for excellence and performance in radio, the enduring power of radio was on full display. “Whether it’s delivering a lifeline or playing the music everyone loves, America’s radio stations are vital to our communities,” said Matt Nathanson, multi-platinum recording artist and host of the awards ceremony. Twenty-one radio stations from California to Puerto Rico were recognized for entertaining and informing communities, saving lives in times of disaster and reaching millions of devoted listeners. WKAQ-AM of San Juan, P.R., won the Spanish Station of the Year Marconi Award for using everything from duct tape to cell phones to stay on the air and broadcast vital updates during Hurricane Maria. Pat Kerrigan, news director at KSRO-AM in Santa Rosa, Calif., praised her station’s work protecting and informing the community as wildfires swept the region in 2017. “When I think about impact now, I think about how many lives were saved by this glorious medium we call radio,” Kerrigan said as she accepted her Marconi Award for Medium Market Personality of the Year. KSRO-AM also took home the Marconi Award for Medium Market Station of the Year. The Urban Station of the Year Marconi Award went to WWPR-FM in New York, N.Y., owned by iHeartMedia. The station is home to “The Breakfast Club,” a nationally-syndicated morning show with 2.7 million subscribers on YouTube and four billion minutes consumed. News/Talk Station of the Year Marconi Award-winner WTOP in Washington, D.C., will celebrate its 50-year anniversary of 24/7 news broadcasting in 2019. “Wherever you are, radio is the heart and soul of your community,” said Randy Gravely, president and CEO of Tri State Communications, Inc. Refer your friends and colleagues to the Free Radio Alliance! Be a citizen advocate – Share your personal story with your legislator. Research shows constituent voices matter to decision makers. Take action – Ask your legislator to support the Local Radio Freedom Act, or thank them if they’ve already signed on. The Free Radio Alliance also raffled off a pair of Bose® noise-cancelling headphones. Best of all, a student DJ won the prize! 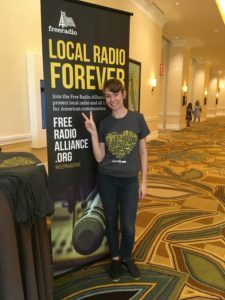 As conference attendees and exhibitors packed up and headed home to their respective cities, towns and radio stations, the words of one Marconi Award-winner stuck with the Free Radio Alliance. Rob Quicke, communications chair at William Paterson University and general manager of its student-run station, WPSC-FM, accepted his station’s Non-commercial Station of the Year Marconi Award together with Station Manager Sebastian Escobar. Read the full list of NAB 2018 Marconi Radio Award winners.